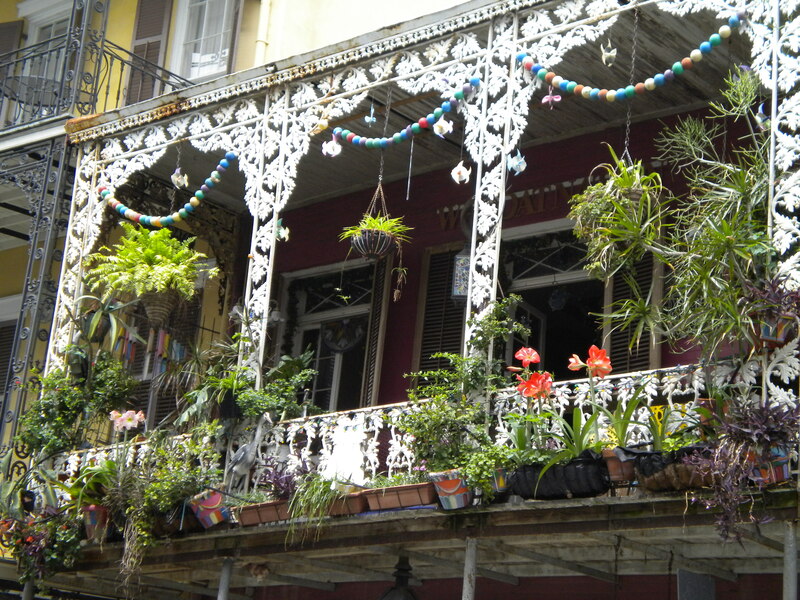 Wrought iron railings with elaborate designs snaked around low-level balconies hanging over the narrow streets. Bright flowers swaddled the terraces, their pungent perfume mingling with the slightly boggy scent wafting in from the Mississippi. Small piles of garbage bags sitting on curbs emitted a stale bouquet that drifted on the breeze and melted away over the clammy river. Blues and jazz burst from the bars on Bourbon Street, infecting the tourists and locals as they sauntered along the cracked pavement littered with remnants of colored beads. I stood beneath an overcast sky on the banks of the Mississippi, and looked down to the charming streets of the French Quarter; it was astonishing that this exquisite and historic section survived the torrent of the muddy waters of Katrina.There was no evidence of her existence, as if it was untouched beneath the spirit of Marie Laveau; but of course, it was not untouched. One stormy night, Hurricane Katrina swept in, irrevocably changing lives, just as one winter night, Rheumatoid Arthritis swept in on me. I woke one morning, swarming with inflammation, the old lady flooding the landscape of my body. It appeared that she arrived without warning, but I recalled the subtle signs of her impending weather system – swollen elbows, mild fevers, burning joints, bouts of fatigue percolating beneath the pain. In mere weeks, Hurricane RA blustered in and spiraled out of control, attempting to drown me in her curse. I learned to tolerate her surges, and surfaced from her gloomy waters like the resilient citizens of New Orleans. The main force of her onslaught eventually receded, and every day I rebuild the dykes to keep her from engulfing me in her torrent. Hurricane RA persists in devastating hundreds of lives; she forces those caught up in her deluge to rise to the surface, salvaging the wreckage she leaves behind and finding a new way to thrive. We hang on to the hope that one day there will be an end to her destructive squall. Wait a moment – is that the sun breaking through the storm clouds? Beautifully put! May the sun shine from now on. Thank you Irma. I look for the sun every day. As you well know, we all must find a way to carry on after this storm hits. Hope you are well. Yes, it certainly felt like a mini hurricane when RA first came flooding into my life. I hope all is well with you.